I’ve been tasked with preparing a staff workshop on social media at work. The age demographic at my workplace is slightly older than the norm, with the average age being around 46, and very few, if any, millenial workers in the bunch. So social media, although our organization uses Facebook and Twitter to communicate, is not a familiar topic among many staff. In fact, some just downright dislike it and don’t want to have anything to do with it. It’s hard for someone like me to understand, since I find it such an interesting way to be able to connect and communicate with your friends and family – and people all over the world – at anytime, any place, using a mobile phone. I know how to use the tools, which is half the battle. I know how to go into my settings on Facebook and block certain people, or block my profile from being viewed by people other than my friends. I know what people can see of my posts and tweets and what they can’t. A good friend once said to me regarding social media: “If you’re an idiot, people are going to find out.” Meaning, if you are rude, ignorant and socially inept in face-to-face communication, that will come out online too. It’s not the social media tools that are bad, it’s who is using them, and how they are using them. Below is an excerpt that I found particularly helpful. Think of some of the older users of the Internet you know, and see if you can spot any familiarities. Privacy is a huge issue – Not that any of us should take our online privacy for granted, but as soon as she made a few Friend connections, she immediately panicked over a couple of them knowing she was out of town and visiting me for the weekend (She lives in Chicago and was visiting me in Memphis). Her fear was that one of them would post something about her visiting me out-of-state, a thief would read that, and her house would be burglarized. Notifications can be stressful After our initial profile set-up and her asking to be friends with a dozen or so people, she opened her email to a flurry of Facebook notifications. I sensed real urgency from her as she sorted through them, along with a feeling of her being overwhelmed. Because of this, I told her that all these notification emails are set up by default, but she can uncheck several boxes to only receive notifications for the activities that matter most to her. If all they know is email… That’s all they have to compare social media to. My mom kept asking me how people ‘send’ her news and photos. It took a few conversations until she grasped that her Friends are posting updates for her to read if she chooses; but no one is actually sending anything to her. Engagement is a two-way street Those of us who live and breathe social media understand the ‘how’ and ‘why’ to proper engagement. But users like my mom can have a hard time grasping the need for the posting of updates in order for news or photos to be spread. I received a handful of, “Well, why am I not seeing any updates by Sandi?” type questions. I also made a point to explain that she needs to post something every once in a while, too, if she ever wants any of her family or friends to hear from her. Friends who are active can seem overly chatty We all know that it takes some time for your social connections to grow. So in the mean time when you have something like 25 friends, you’re going to want to tell Cousin Bob to shut the heck up because his thrice-daily posts comprise 80% of the content on your wall. What else do you think newbies to social media need to know? Do you think it’s time for people to get over the fear of social media since it has become such a huge part of social interaction? Is this a good thing? I’m working on an article for a column I’m co-writing with my Social Chicks partners, and it brought back a writing tip I learned in one of my writing courses. After you finish writing a piece, look back at the beginning and write a new opening paragraph. This is because often when you start writing you don’t know what form or angle the piece is going to take. After you have written it, you have a better idea of how to summarize it and usually your original first paragraph ends up being more appropriate as your second paragraph, and you can re-write the first one to more accurately sum up the ideas to follow. I have found this to be true in nearly every writing project I have ever written. It’s also a great way to let go of writer’s block when staring at that first blank page (screen) and just dive in, start writing, and give yourself the permission to go back and properly introduce your topic later. It’s a great way to hash out your ideas before you commit to the first paragraph. Have you ever found this to be the case in your writing? How do you avoid writer’s block? Oh god. I know I said I’d be around far more often in my last post, but with all the work I’ve been doing I didn’t have much energy left for the blog. I know – bad. But I’m committing to spending one evening a week writing up a few blog posts to share throughout the week so I can share more about what I’m doing and my thoughts on communications and marketing topics. I have to be honest – I’ve been cheating on this blog a little bit. I launched another blog, Designfraud, where I am documenting my home design and decorating loves and projects I’ve been doing in my own home. It’s been really fun, because it’s a different side of my creativity that I have been playing with, so I’m looking forward to keeping that blog up too. 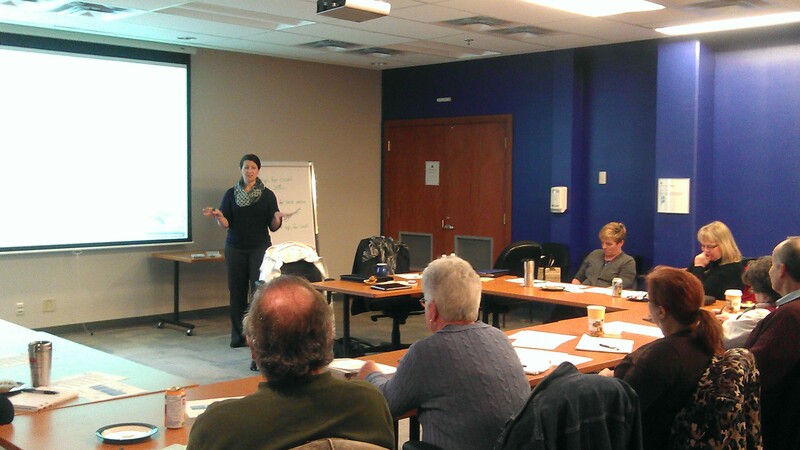 The Social Chicks did another workshop, this time for local environmental partners in preparation for Earth Day celebrations. It was hosted by the Ridge Meadows Recycling Society, and the Chicks worked with 10 people from different community organizations to talk about how they can use social media to promote their activities around Earth Day, but also how they can all connect and network online to support one another’s initiatives. Most of them were familiar with Facebook, but Twitter was new to many of them, and we had lots of discussion about hashtags, using third party applications, and how to use lists to “block out the noise.” They were a great group to work with and I look forward to seeing what kinds of connections they make and the success they have with social media! Today I had a fantastic time talking to the graduating class of my alma mater, the Print Futures: Professional Writing program at Douglas College. It was hard to believe I have been finished for two years! I told them a bit about the communications work I’ve been doing since I graduated, and offered some tips on job hunting and being a “star” employee. I know how nerve-wracking it can be to graduate, thinking you don’t know enough to get a job as a writer, but having been through that intense program, I know without a doubt that those students have excellent chances of doing great things, whether they are writers, editors, communicators or some similar field. I thought later I should have taken a picture of their smiling faces to share, but I didn’t think of it at the time. Oh well. but they will be presenting their work at the annual Print Futures: Professional Writing Portfolio Show on April 14. If you want to see how “the medical school of writing” can turn regular people into amazing writers, check it out. That’s about it for now! More to come soon! Back in November, my “alter-ego,” Hip Chick, as part of the Social Chicks, participated in facilitating a workshop for businesses on social media. We had a sold-out crowd, and enjoyed some great discussion about social media and engaging online. Unfortunately, the meeting room’s wi-fi couldn’t handle our group’s needs and a few participants had trouble logging on and staying logged in. We’ve been doing follow-up visits with them to help them get their pages and accounts set up and running. Most have now gotten their Facebook and Twitter identities active and are now busy connecting and communicating. Interested in attending a Social Chicks workshop? We’re planning a few more in the next few months, so stay tuned! I just got back from meeting with a participant of the Social Chicks workshop and helping them get their Facebook and Twitter up and running. Throughout the process it gave us an opportunity to talk about social media ettiquette and how to get the best value out of each tool. It got me thinking about ways to connect and engage through social media, so I have jotted down a list. Feel free to comment and add more if you like! 1. Offer valuable content. Re-tweeting other people’s content is good, but be a producer too. Offering a perspective, sharing a link on a relevant topic, and being generally interesting are important if you want people to engage with you. 2. Like or follow others, and they will like or follow you back. It’s Twitter ettiquette, but you can meet really interesting people this way. 3. Comment. If someone shares something you find interesting, let them know you’re listening. Start a conversation. Just recently, I commented to someone on Twitter that I appreciated her use of a hashtag for a diploma program I took, and once we got talking we realized we had both graduated from the program. Now we’re planning a get-together for program grads. 4. Link and Tag. Make sure you credit the originator of the content you’re sharing. People appreciate that, and it can be a great conversation starter. 5. Don’t be afraid to be transparent and “real.” You can find tons of stories online about people who said or did stupid things on social media, but that doesn’t mean you need to be all business, either. Social media is the human side of your online communication; don’t be afraid to chat, share opinions, and be authentic. 6. Be consistent. It’s great to have variety (we’re not one-sided beings, are we?) but if you have expertise in a specific area, why not share it? It doesn’t have to be what you do for work, it could be a hobby. Some of the first conversations I had on Twitter were with some car enthusiasts who responded when I tweeted that I was looking for a new car. They had great tips that figured into my final purchasing decision. 7. Be supportive. If someone is hosting an event in your area, share it, even if you can’t attend. If there’s a great deal being offered at your favourite business, pass it on! 8. Share and Retweet. Need I say more? But one word of caution – don’t do it for the sake of doing it. Read the article before re-tweeting it. Don’t share something if you aren’t that interested. Remember to be authentic. 9. Be local, even if your business isn’t. Get involved with the local scene on social media. When I started using Twitter, I didn’t think there were that many people in my area. But once I started following people from my city and general region, I ended up meeting some pretty fantastic locals. And even better, we all support each other’s businesses and events. 10. Get offline, too. If there’s a Tweet-up in your area, go! It’s a great business and personal networking opportunity. Social media allows you to meet people that you may not have otherwise, and you never know what benefits will come to your business by connecting with people behind the profile photos! One of the things I love working on with clients is creating a plan for their journey into social media. Social media has become a pretty standard part of communicating with customers and other stakeholders, and many people jump into it without thinking about what they want to get out of it and how they will “do” their social media. The benefit of social media is that it allows you to create a voice and a personality for your business that print ads and even broadcast doesn’t allow. All those types of marketing don’t have a function for feedback and interaction with your audience; you are just broadcasting a message out there. But tools like Facebook and Twitter let you have conversations in real time, so you can answer those questions from potential customers, give product or service information, or even just share the latest news. Creating a plan for how you will use social media is a great exercise because not only do you plan how you will use the tools, but you should also look at what you want to get out of it. Are you looking for word of mouth advertising? Sales leads? Create alliances with other businesses in your community? There are lots of opportunities, but you need to define what you want to achieve in order to measure your success. What do you want to accomplish by using social media for your business? Are your goals realistic? What tools will help you reach your goals? 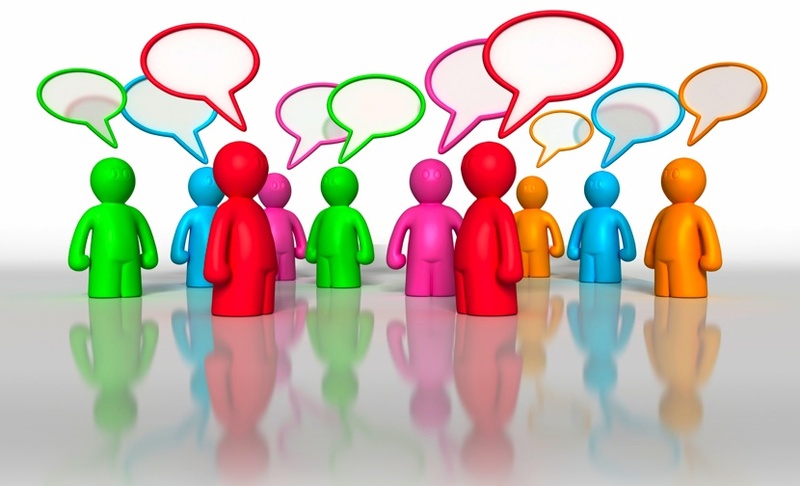 How will you integrate social media into your current communication or marketing? How will your social media be managed? How do you expect your staff to be involved? How do you expect your staff to behave on their personal social media sites in relation to their work with you? Who are you speaking to? Who is your audience? What kind of content will you be sharing, and what will be most valuable to your audience? There’s a lot to consider, and it’s a lot more than just throwing up a Facebook page and posting! One of the most useful pieces of advice I’ve received was from Kemp Edmonds, who gave a talk at a social media workshop I attended through the Ridge Meadows Chamber. He suggested you think about your target audience, your best customers. Think about their lifestyles and what they are interested in, and share content that will match those interests. For example, when I was working at a renovation company, we started posting links to information about other renovation projects like painting, window dressings, easy furniture upholstery, and other home improvement ideas. It got a great response and it addressed the interests of our target audience – which was not just renovating their homes, but home improvement in general. Creating a social media plan can be fun – it’s a look at the personality of your business and it can give you the opportunity to personalize your product or service. People are much more likely to do business with someone they know and trust, and are less likely to do so just because of an ad they saw. So what part of your company’s personality will draw your best customers? Think it’s time to create a social media plan? If you need help, I’m happy to work with you – just send me an email through my Contact page. Interested in learning a little more? I found this great article on Social Media Examiner (a great site – bookmark it or add it to your feed,) with 5 Easy Steps to a Winning Social Media Plan. 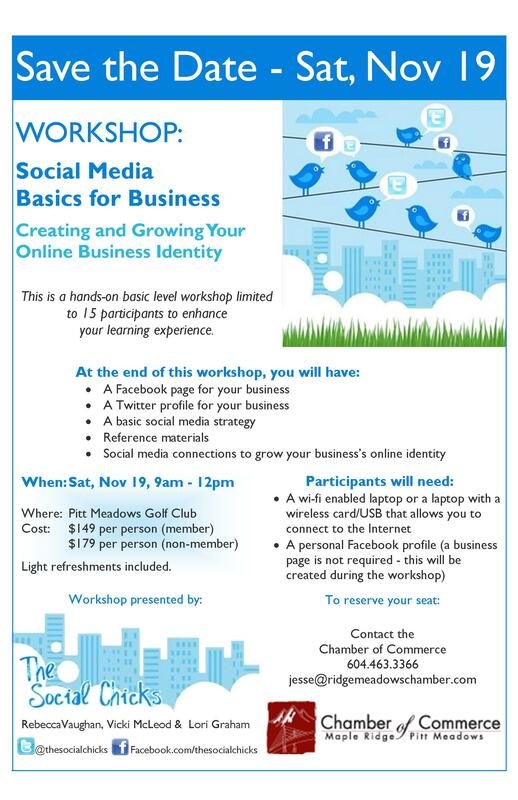 Social Media Basics for Business: only a few spots left! There are only a few spots left in The Social Chicks’ upcoming workshop, “Social Media Basics for Business!” If you know of a business looking to get started on Facebook and Twitter and aren’t sure how, send them our way! We will be covering the social media basics, including setting up a Facebook page and a Twitter account during the workshop. Then you’ll learn how to use the tools, who to follow and what kinds of content to post, as well as how to build relationships through social media. You’ll even come away with a workbook of extra tips and tricks. Just a few spots left, so register today! Mission statements and vision statements: do your customers need to know? I have worked with many clients on web writing projects, helping them develop the content for their websites. My goal is always to think about the reader, i.e., the (potential) customer. What information are they looking for on the site, and what do they need to know? However, there are many business owners out there who believe that their vision statement and mission statement deserve a place on their website, and some believe these deserve their very own page on the site, too. You can probably tell by my tone of writing that I don’t agree. Thinking like a customer, I look at most websites like this: I am going to visit this site to get information on your company to make a decision on whether I will do business with you. I will look at your About page that tells me who you are, a page that tells me about the work you do (such as Services, Projects or Clients), I might check out your blog to get a sense of the “flavour” of your business, and if I like what I see, I’ll visit your Contact page. I’m willing to bet that there is a very small (as in, miniscule) amount of traffic going to the “Mission Statement” page or the “Vision Statement” page. And here’s why: your customers don’t care about your vision or your mission. Some business owners are a little shocked, and maybe even a little hurt to hear that. (The first time I resorted to saying it to a client who insisted on it, he looked a little offended, then was thoughtful a moment before saying, “You know, you’re probably right.”) Of course you have worked hard on developing this statement to guide your company for the short and long term, and it defines who you are as a business and where you are going. You might be, and should be, emotionally invested in it. But it’s not the information your customers are looking for. Use testimonials: not on a single testimonial page, but scattered throughout your site. A blog can also allow you to tell about examples and case studies of some client problems you were able to solve, and discuss trends in your industry that show you’re an expert in your field. So what is the mission statement or vision statement for, then? I recommend to my clients that they keep them posted in their offices, for themselves and their staff to see. It’s an internal document to help remind your team of your direction and goals, and a guide for the short and long term, in both decision-making and in practice. It’s just not a marketing piece. What’s your experience? Do you normally check out the mission or vision statement of a company you’re thinking of doing business with? Why or why not?